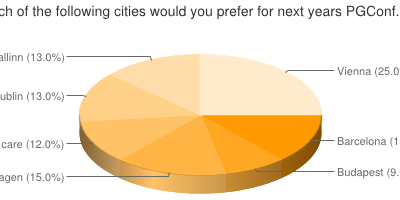 So what actually drives people to come to PGConf.EU? A lot of people consider the location important. But given the response to the previous question, we can only conclude that which location it is is less important, as long as it's a good location. For whatever definition of good location. It is also fairly clear that price is a fairly important part of making it possible for people to come, but not quite as important as the location. Presumably this price includes the cost of the conference itself, as well as the cost of staying (hotel, food etc) and traveling to the location of the venue. We can clearly tell that the presentation content is very important - about as important as location and slightly more important than price. The fairly large number of people who don't consider it very important are likely the people who attend mainly for the hallway track. The availability of training is a lot less important - with it being completely uninteresting to over half of the attendees. 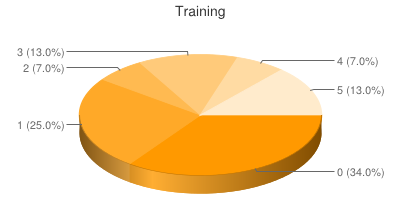 This is not particularly surprising, since only about 1/3rd of the attendees take part in any of the training. It does remain pretty important to those who do attend, so it's definitely a concept worth continuing. This question was rather obviously asked because we are considering raising prices. In fact, it's quite likely that we will raise prices next year. 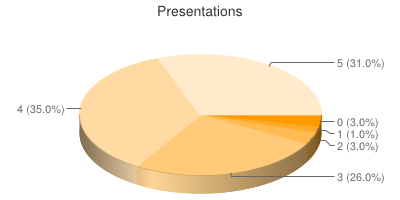 This year, we actually lost money on each attendee - the amount we paid to the venue for room, food and beverages was higher than the attendee cost (and this does not include those attendees who got discounts for early bird, training attendance or being a speaker - for those, we lost more money). This is usually ok, because we have sponsors covering the difference. However, the fact that we got about 70 people more than we expected had a rather severe effect on our budget. For next year our aim will likely be to "break even" on attendee fees, and "using" sponsor fees to cover discounts and conference room rentals/equipment. This will almost certainly lead to a (small) increase in the attendance fee. 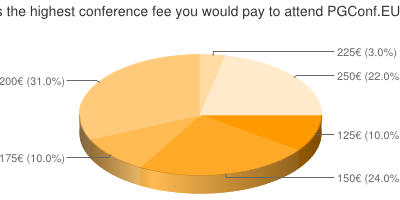 Looking at this feedback, this will cost us about 10% of the attendees right away (this years fee was €120) - unless these people happen to be in one of the discount categories. That is very unfortunate - but it may be unavoidable. It seems if we raise to about €150, we've still got most people with us, but after that we loose over 25% - which is not good at all. Finally, more than 50% would be happy to pay €200 - a fair amount of those are likely the attendees who's employer pays the attendance fee. 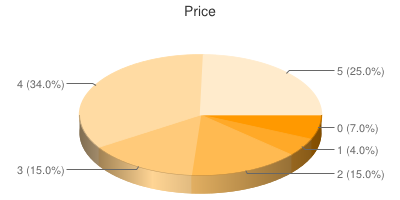 We are still the cheapest of the large international PostgreSQL conferences, and we will do our best to find a balance between being able to keep the price as low as possible, while delivering good service. Our goal is not, and has never been, to make money off our attendees - but we do need to not loose money. We hope to see you all again for next years conference! Until then, check out our one-day event before FOSDEM in February, in Brussels, Belgium!